Here’s a version of roulette games that no one would ever have expected. Double Ball Roulette! Yes, one wheel that has two balls instead of just one rotating around the inner rim. Perhaps you’re wondering how two balls can revolve around one track without hitting each other and bounce off the table. Compressed air is used to simultaneously shoot both balls from a tube, so the second ball always trails the first one, eliminating any chance of a collision. To make it more exciting, a remote control button is rotated among players to trigger the air gun and get the balls rolling. Most of the betting layout for DBR is the same as traditional Double Zero roulette, however the payouts differ in that a player has two chances to win instead of just one. For the outside wagers, both balls must land on the player(s) selected betting spots in order to win. For example, a bet on black would require both balls to land on black numbers. Winning payout amounts for this particular wager are increased to 3/1 instead of an even 1/1 as in traditional roulette games. For the inside wagers, (a bet on the numbers only) either ball can win but the payouts are less than traditional roulette because the player now has two chances to win. For example, a bet on one number would return 17/1 instead of 35/1. If both balls land in the same pocket, the bet would return 35/1. 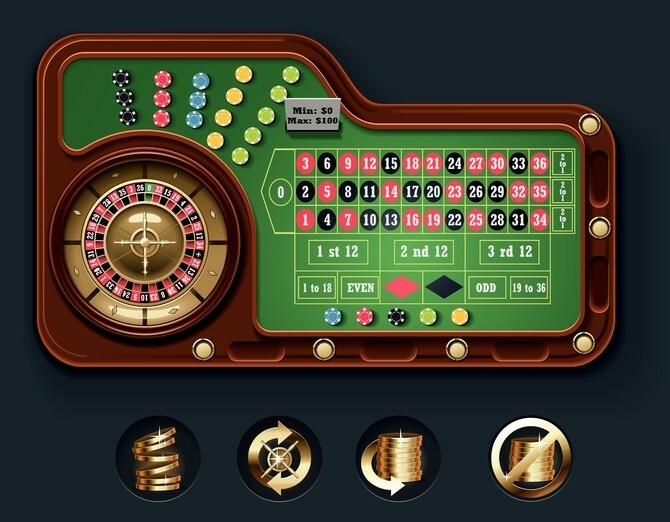 If you never played roulette before I’ll detail the wagering options, winning payouts and the differences between both traditional and Double Ball Roulette. One number (straight up) pays 35/1, two numbers (split) 17/1, three numbers (street) 11/1, four numbers (corner) 8/1, five numbers (basket) 6/1, six numbers (line) 5/1. One number (straight up) 17/1 if either ball lands on the chosen number, 35/1 if both balls do. Two numbers (split) 8/1 or 16/1. Three numbers (street) 5/1 or 10/1. Four numbers (corner) 7/2 or 7/1. Five numbers (basket) 5/2 or 5/1. Six numbers (line) 2/1 or 4/1. Red or black, odd or even, 1/1. First eighteen or second eighteen, 1/1. First twelve, second twelve or third twelve, 2/1. First, second, or third column, 2/1. Red or black, odd or even, 3/1. One red, one black, 1/1. First eighteen or second eighteen, 3/1. First twelve, second twelve or third twelve, 8/1. First, second, or third column, 8/1. Remember both balls must land in your bet selections in order for you collect. There is also a side bet called Double Ball Jackpot. If you think both balls will land on a certain number, make the side bet and collect 1300/1 if Lady Luck is with you. Additional publications and videos about roulette, casino gaming and other products can be found on Amazon. Direct link from this page to purchase.